US Secretary of State, PM Netanyahu deliver remarks upon Secretary Pompeo's arrival in Israel. PM: Golan will always be part of Israel. Prime Minister Binyamin Netanyahu and US Secretary of State Mike Pompeo delivered joint remarks during their meeting in Jerusalem Wednesday evening. 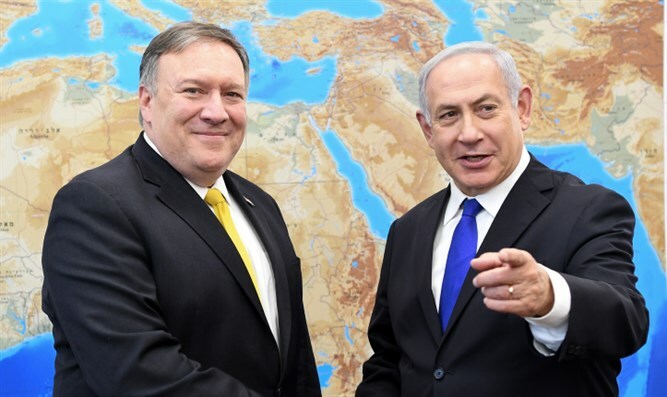 "You've been an extraordinary champion of the US-Israel alliance," Netanyahu told Pompeo. "I want to thank you and President Trump for everything that you've been doing to support this partnership." "Working together we've been able to achieve an enormous amount," he added. Netanyahu also praised the Trump Administration for moving the US embassy to Jerusalem. "No less historic is the president's decision to walk away from the disastrous nuclear deal with Iran. He said he would do it, and he did it. He said he would reimpose tough sanctions on Iran, and he did. What we see is that this pressure is working. "We need to increase it. We need to expand it. And together the United States and Israel are working in closes coordination to roll back Iranian aggression in the region and around the world. The secretary and I just spent the first part of our meetings discussing how to do that, and I think that there are ways that will intensify the pressure even more. Rolling back Iran is in the interest of peace, stability, and security for Israel, for our neighbors, and for the world," Netanyahu said. "We will continue to take action as need against the attempts of Iran to entrench itself militarily with dangerous weapons in Syria. There is no limitation to our freedom of action, and we appreciate very much the fact that the United States backs up our actions as we do them. He warned that if Israel did not control the Golan Heights "we would have Iran on the shores of the Sea of Galilee." "For this reason, and for many more, I think it is time that the international community recognize Israel's stay in the Golan, the fact that the Golan will always remain part of the State of Israel." Secretary Pompeo said in his remarks that "Israel has a special place" in his heart. Pompeo wished the people of Israel a happy Purim holiday, and recalled Netanyahu's speech about the Iranian nuclear threat before Congress in 2015, which took place shortly before Purim. "The Ayatollahs have spent four decades spewing hatred, supporting terrorist violence, and pursuing nuclear weapons for a war against a neighbor that wishes nothing more than to live in peace. The Ayatollah has declared that the annihilation and destruction of Israel is his primary goal. "With such threats a daily reality of Israeli life, we maintain our unparalleled commitment to Israel's security and firmly support your right to defends yourselves," he said.